This product requires the base game Heroes of Might and Magic V.
For the first time, play as the Orc faction and recruit heroes, build armies and manage cities as you explore and conquer legendary lands. Use tactics, skills and magic to outsmart fantasy armies while developing your heroes and unveiling the dark plot that threatens to tear the world of Ashan apart. Every creature in the Heroes V universe will get an alternative upgrade, increasing the total number of creatures in the Heroes of Might and Magic V line to over 170! Expand your arsenal and gameplay with new spells, new artifacts, new buildings and innovative new features such as the combo-based Artifact Power Link and Battle Rage, the unique racial ability of the Orcs. 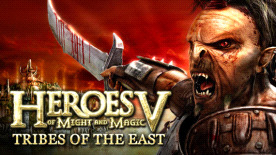 Heroes of Might and Magic V is required to play this DLC.